So far no other life has been discovered outside the Earth. This doesn't mean anything. Maybe space is full of life, maybe we are alone, we don't know. But it is possible to make some reasonable suggestions, emanating from what we find on Earth. Because the laws of nature are the same everywhere in the universe. Life must be made of something. In our universe exists matter and energy. Energy can't form life because it can't agglomerate to such complex designs. So it will be matter. It is unknown how dark matter can interchange with itself and other matter, we only know about it because of its gravitation. So it isn't suitable for any life we could discover. Remaining are the atoms familiar to us, which we can find everywhere in the universe in stars and nebulae. Only atoms are not enough, they have to join each other to become molecules. First simple, later more complex ones, because this is a precondition for something that could be called life. Simple molecules like e.g. water (H2O) are lacking the ability to reproduce and sufficently store data. A large part of the matter visible to us is in stars. However these have temperatures of more than 2500 degrees centigrade. For most molecules this is deadly, they decay into their atoms. Some few especially stable ones like titanium dioxide (TiO2) can endure temperatures of several thousand degrees. But with titanium dioxide alone you can't produce much life. Stars therefore aren't a good choice. 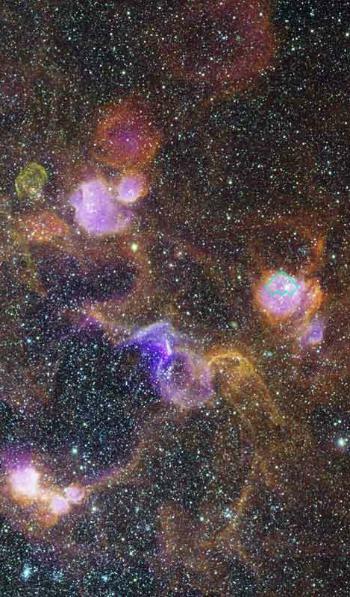 With the numerous clouds of matter (nebulae) it is another thing. Here we can find much lower temperatures and indeed there have been found organic molecules like formic acid (HCOOH). Of course without the corresponding ants. But with these clouds there is another problem: they are extremely large and very thin. They consist nearly solely of hydrogen and helium, other elements are rare. So life there would be very lonely. And these clouds are mostly very cold (dark clouds like the Coalsack Nebula), which slows down any chemistry there. Glowing clouds like the Orion Nebula on the other hand are too hot. Therefore clouds of matter aren't considered seriously as suitable for life. It remains the surrounding of stars - planets. The number of stars with planets is somewhere between one and twenty percent, so there are plenty of them. Here we find, according to the type of the star, the planet and their separation distance, many possible combinations. Several of these could provide the conditions for life. The requirements are: comfortable temperatures (in which interval is quite unsure, maybe 100 - 500 kelvin, maybe only 250 - 350, depending if e.g. liquid water is needed indispensably or not), a suitable star (main sequence star red to white) and a terrestrial planet or a moon with atmosphere. The temperature depends from the star's temperature and the distance of the planet from the star. Admittedly, hot blue stars emit a very unhealthy radiation, ultraviolet one, which destroys complex molecules. Furthermore these stars are short-lived. So they drop out. With the small red dwarfs a planet only can be in the habitable zone when it is very close to its star. But then its orbit is tidally locked, which means always the same side faces the star. The consequences of this are not quite sure. Anyway the forefront will be very hot and the back side very cold and there will be strong winds. Maybe these could distribute the temperatures somewhat steady all around the planet. Then life would be possible, but different than what be know from Earth, because photosynthesis is much more difficult with red light. On the other hand it could be that the nearby star blows away the atmosphere on its side and leaves behind a half glowing - half frozen chunk of rock (like Mercury). That yellow stars permit life we know from our Sun. Orange and white stars should be adequate as well. But the planet too has to fulfill some conditions: gaseous planets should be unsuitable. In the huge atmosphere pressure, storms and electric discharges are too destructive. And on the rocky core it doesn't look any better, the pressure here can be several million atmospheres. Aside the atmosphere consists nearly exclusively of hydrogen and helium. So terrestrial planets and moons remain. These have lost the most part of the light elements hydrogen and helium. When they aren't older than 8 - 10 billion years there should be enough heavy elements available. Moons, like Titan, can indeed keep a mentionable atmosphere. And giant planets like Upsilon Andromedae d could have Earth-sized moons. With these celestial bodies there is a large span which could evolve life. But not all that could really will make it. This we know of our solar system. So what is necessary that an evolution can start? This is the big unknown factor. At least we need an atmosphere and a liquid medium like water, but methane could be right as well. With this a not to extreme pressure and comfortable temperatures. Then a chemical evolution can produce stuff like amino acids and proteines, from which after a very long time the first life forms could evolve. Our Earth is 4.6 billion years old. Since 3.5 billion years there exist primitive protozoa, since 1 billion years metazoa, since 530 million years vertebrates, since 5 million years humans and since a few thousand years we call ourselves intelligent. That this evolution speed is representative for extraterrestrials can be supposed, because naturally complex things need a long time. Alien life in space: very very likely. Intelligent life in space: likely. Life near us (~ 100 light-years): likely. Intelligent life near us (~ 100 light-years): very very unlikely. How can we discover alien life, if this doesn't communicate with us, that is doesn't send us neither radio signals nor UFOs? One possibility would be the finding of ozone on exoplanets, because it seems that ozone can only form in metabolistic prozesses in creatures. An accordant project to detect ozone is planned. N 63 in the Large Magellanic Cloud.